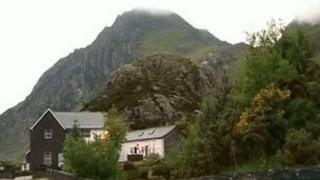 Several walkers and climbers have been rescued in Snowdonia, a number of them in poor weather conditions. Ogwen Valley Mountain Rescue carried out four operations on Saturday, including three calls in quick succession from 17:00 GMT. The longest rescue saw four students winched off the east face of Tryfan after getting stuck while rock climbing. An RAF rescue helicopter lifted them to safety in the early hours of Sunday. Chris Lloyd, of Ogwen Valley Mountain Rescue, said the first call was early on Saturday afternoon when a woman with back aches walking with a group up Tryfan was escorted down by a team member. He said there were three calls in quick succession in the evening. One was from two men from Essex who lost the path due to snow on a steep face by Devil's Kitchen at the back of Cwm Idwal. Six rescuers brought them to safety. The next call was a student from Merseyside with an ankle injury, and she was stretchered down. The final rescue was of the four students, who took longer than planned to climb and felt they could not safely abseil down as the weather worsened, with snow and lightning. The helicopter from RAF Valley on Anglesey found it difficult to reach them, said Mr Lloyd, but it was eventually able to lift them off.